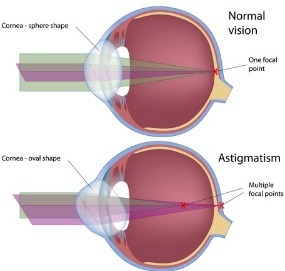 Astigmatism primarily has to do with the shape of the front surface of the eye (i.e., the cornea). Imagine that we took a map of the surface of your cornea. If the shape or curvature of the cornea was the same throughout, then it would be like a basketball, or spherical. Now suppose the shape is flatter in one meridian (e.g., going up and down) and steeper (or more curved) in another meridian (e.g., going side to side), the corneal shape would be more like a football. Assuming that the meridians are 90 degrees apart, this is regular Astigmatism. When the meridians are not 90 degrees apart, then the Astigmatism is irregular, which is rare. Less commonly, this can be due to an irregularly shaped crystalline lens and can be present in eyes with Myopia, Hyperopia, Presbyopia, and/or Amblyopia. More than blur vision, astigmatism distorts vision, especially of vertical, horizontal or diagonal lines. The corner of a square object would look rounded. This consists of an error of one diopter or less. At this amount, the disease may be masked by certain types of soft contact lenses. This means you may not need toric soft contact lenses to adequately correct your vision. Rigid contact lenses are effective in masking or even correcting the disease, at times as high as 2.00 diopters. Glasses give the sharpest vision in correcting the disease because technology makes it possible to generate astigmatic surfaces in ophthalmic lenses. Astigmatism ranging from 2.00 to 3.00 diopters can be regarded as moderate. High usually refers to 3.00 diopters or higher. If wearing contact lenses to correct for this amount, it is necessary to order custom made contact lenses, either soft or rigid types. Progressively high astigmatism, especially if irregular, can point to corneal disease such as Keratoconus. Irregular can be more difficult to correct. What are the Causes and Can it Get Worse? This disease can be genetic. Ocular trauma can cause damage to the cornea or internal eye structures creating this disease. Similarly, surgery can result in scarring that leaves the eye with this disease. For example, Pterygium removal can leave scarring on the cornea and result in an irregular surface. As mentioned earlier, corneal disease, like Keratoconus can also lead to a condition that gets progressively worse. Chronic eye rubbing from ocular allergies can also aggravate the disease. This disease can even get worse from unusual sleep positions. For example, if you consistently sleep with your face on the pillow or on the left side with your face on the pillow, you may be changing the shape of the front surface of your eye or eyes over time and thus worsening any existing disease. This may be due to an irregularly shaped lens, which is located behind the cornea and iris (the colored part of the eye). Custom made toric rigid contact lenses and glasses can be used to correct for this type of disease. 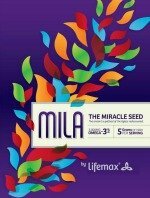 What is the Test for This Disease? This test is used to determine if you have the disease. You cover one eye and view the Astigmatism dial. Do all the lines appear equally dark? If some lines appear significantly darker than others, then you have the disease. You then repeat the test on the other eye by covering the opposite eye. If all the lines appear equally dark, then you do not have the disease. How is This Best Corrected? Ophthalmic lenses for glasses can correct your disease. However when your disease is moderate to high the use of glasses can create bothersome distortions, especially in the periphery of the lens. Luckily toric contact lenses can help you see well with less distortion. These lenses come in different materials to fit your daily needs. The designs of toric contact lenses today are much more consistent than they used to be in the past so that your vision stays clear and stable instead of coming in and out of focus. What Options Do You Have for Contact Lenses? Some of the options that your eye doctor can offer you include toric contact lenses made of soft materials designed to be worn on a daily disposable, daily wear (generally two or four-week replacement schedule) or extended wearing schedule. Another option is gas permeable lenses designed using more rigid plastic materials. Each type of lens has its unique advantages. Consult your eye doctor to determine what options are best for you.